Investigation: What Factors Affect Seed Germination? In the spring, flowers begin to bloom and you may see sprouts in the garden. How do plants know when it's spring and when to grow? If a seed grew too early, it might be exposed to a harsh cold environment. If it grew too late, it might not have enough water to survive. 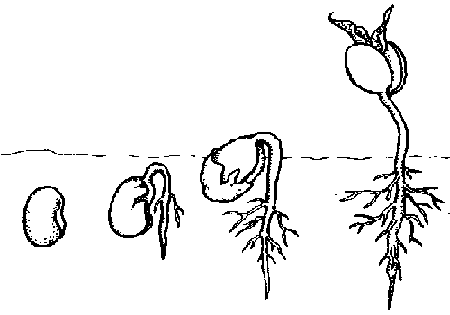 The process by which an organism grows from a seed into a plant is called germination. The seed of a plant is the embryo, and it contains enough energy for the plant to survive until it is time to start growing. In some cases, these seeds can survive for years. What triggers the seed to start growing? It varies by plant and by the environmental conditions where the plant grows. The giant sequoia trees of California require fire to germinate. This adaptation ensures that new trees will grow when there is an opening created by the death of other trees. If the seeds germinated without fire, the seedlings would be too shaded to grow. Not all plants need fire to start growing, but most do take the cues from the environment. In this activity, you will investigate factors that can affect the germination of a seedling. Several variables might affect the germination, these variables include: light temperature water soil type air quality. Choose ONE variable to investigate. Write a hypothesis below. Remember, that the hypothesis should be a complete sentence that can be tested. With your lab group, determine how you could test the variable. What kind of data will you gather? Will you have a control group? What kind of materials or equipment will you need? How many seeds will you use? Sketch or describe your experiment below. Your instructor will approve your plan before you set it up. Most seeds will germinate in a few days. Plan to make observations over the next few days and organize your observations below. Be as detailed as you can about what you see. Create a lab report or infographic that includes the following information from this investigation. You have written things down on this paper, now it is time to organize the information into a formal report. This report should include four detailed sections. 4. Conclusions: Use your data to answer the experimental question. Be specific in how you write this, your conclusions must follow your data, even if they didn't turn out as you were expecting. 5. Reflection: In this section, discuss how your results may provide insights into how the environment can affect plants in general and how this information can be useful to humans. For example why would farmers need to consider germination factors when planting crops?